When you switch from your LG G5/G4/G3/G2 to iPhone 8/7/7 Plus/6S/6/5S/5, the most important thing on the to-do-list is transferring your important data from the old LG phone to the new iPhone, such as contacts, text messages, photos, videos and many many more. They are important to you that you cannot maintain your social life without them. Then, how to get all of the important information from your LG phone to your new iPhone? 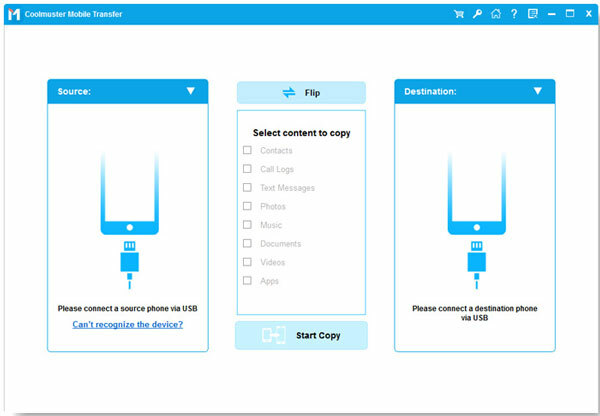 To move data (here we set SMS as example) from LG to iPhone, and vice versa, you need a third-party transfer tool called Coolmuster Mobile Transfer. It is specially designed to transfer files among different mobile operating systems, including iOS, Android and Symbian. 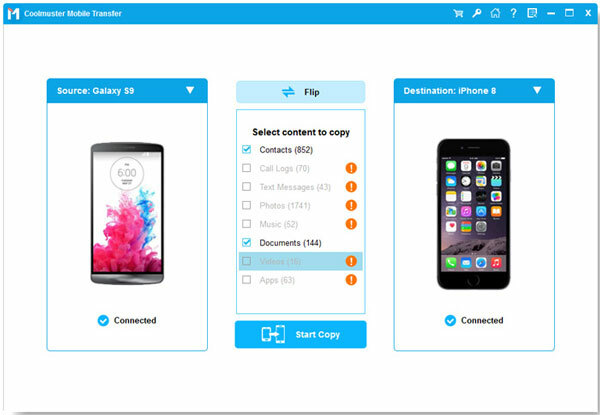 It supports transferring overall file types, including contacts, text messages, photos, videos, music and apps. All major LG and iPhone models are supported so you don't need to worry about that. All text messages can be transferred between LG and iPhone without any quality loss. Just connect the two phones to the computer where you have the Mobile Transfer installed and everything can be done in minutes. How to Copy Text Messages between LG and iPhone? Once you have connected your LG phone and iPhone to the computer via USB cables and Mobile Transfer is installed, you can launch the program and it will detect the two phones. Choose "Phone to Phone Transfer" option from the main interface and click "Start" to enter the phone transferring window. Then, you can see the two phones are displayed side by side, with all transferable file types listed. If you only want to transfer SMS, you should tick off the text messages only and then click the transferring icon in the middle to begin the SMS transfer from LG to iPhone, and vice versa.